The rate of polling has increased dramatically since the convention ended. 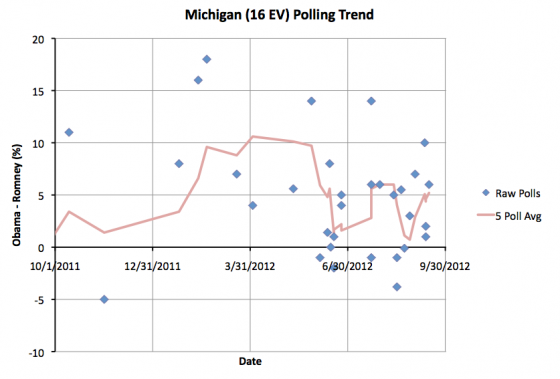 It is now not uncommon for my daily sweep for new polls to pick up six or more new polls. In the pre convention days, having three polls on a single day would be a big day. This increase in poll frequency of course makes it likely that we’ll have more days where states flip categories, even if it is just from the natural jittering of random samples rather than real movements. So be sure to watch not just for the states that change on a given day, but also look to see if that change “sticks” as time goes on and new polls come in. First up Michigan with 16 electoral votes. 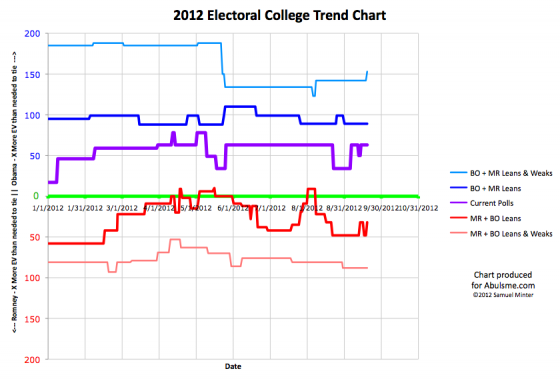 It has bounced back and forth across the 5% Obama lead line the past few weeks in the five poll average. 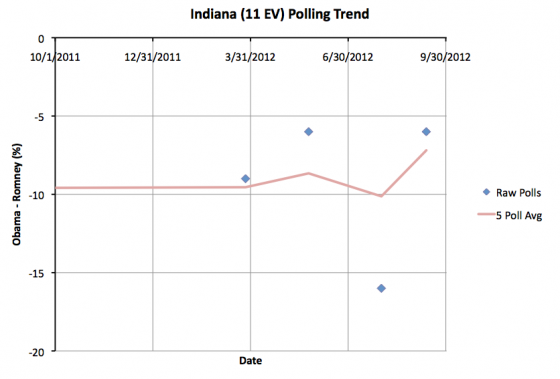 September started with Obama having an 0.7% lead in the state. 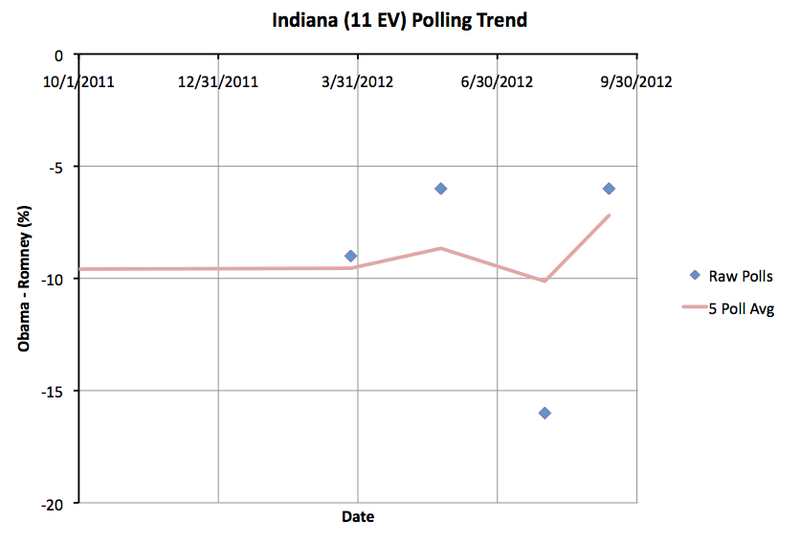 September 13th his lead increased to over 5%, but then dropped below 5% again on the 16th. Now on the 19th it heads above 5% again. The general trend has been toward Obama, but at 5.2% the state is still quite close to the boundary between my categories. So it would be easy for the very next poll to pull the average back below 5%. For the moment, the state moves from my “Lean Obama” category to my “Weak Obama” category, meaning that I no longer consider Romney winning Michigan a possibility strong enough to include in his “best case”. But don’t be surprised if it gets closer and changes categories again. It looks like it is having fun bouncing back and forth at the moment. Next up, Indiana with 11 electoral votes. Indiana has been very sparsely polled. Only four Romney/Obama polls in the state since the 2008 election. To round out the five poll average I have to include the 2008 McCain/Obama election results. In any case, prior to the last poll, the five poll average (which then included the 2004 election too) had the state with a 10.1% Romney lead. Shifting the new poll in, and 2004 out… 2004 was a huge 20.7% Bush victory over Kerry in Indiana… makes Romney’s lead drop to 7.2%. This moves Indiana out of my “Strong Romney” category into my “Weak Romney” category, but make no mistake, Romney’s lead in Indiana is still quite substantial. At the moment nobody is expecting Obama to be able to reprise his 2008 win in the state. We’d need more polls than just the four to discern if there is actually any sort of trend making the state closer, but a little bit closer or not, it still isn’t close enough to be one of the states that could go either way. This is a Romney state this year unless we get a huge Romney collapse in the next seven weeks. Once again no mathematically “must win” states for Romney, but the paths are still narrow… this is a hard map for Romney. If he doesn’t win Florida, he has to win every other close state to win. If he does win Florida, he can afford a few losses in the close states, but not many. But if he loses Florida, it is hard seeing how he wins the other close states he would need to win. Romney still needs a game changer to move things in his direction. And I’m pretty sure the events of the last few news cycles are not the kinds of game changers he needs. 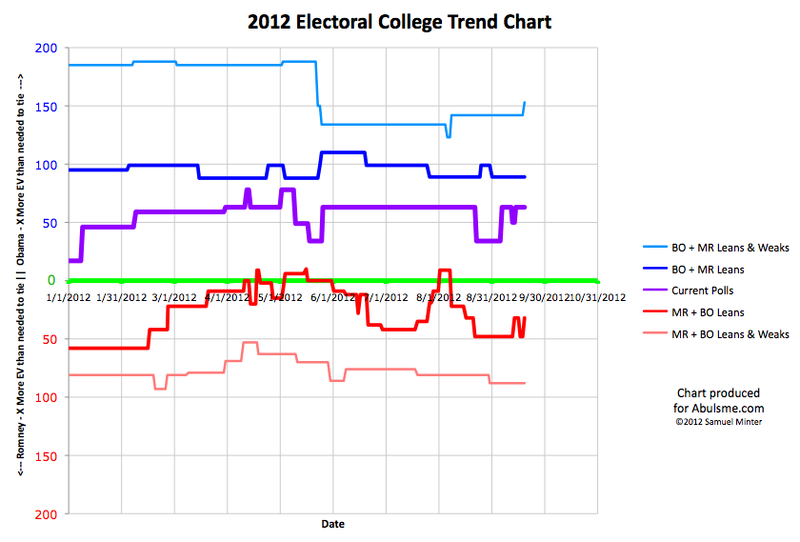 Note: Chart and map from the Abulsme.com 2012 Electoral College Prediction page. Both assume Obama vs Romney with no strong third party candidate and show polling as it currently exists. Things will change before election day. 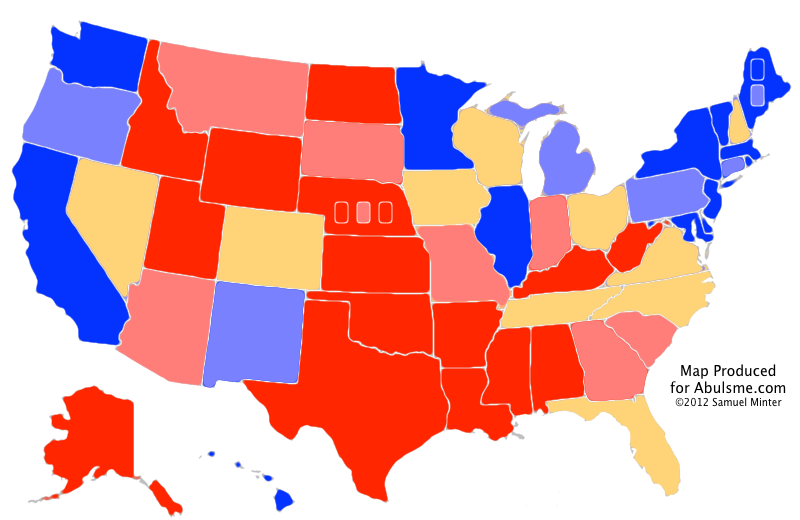 On the map red is Romney, blue is Obama, gold states are too close to call. Lines on the chart represent how many more electoral votes a candidate would have than is needed to tie under several different scenarios. Up is good for Obama, Down is good for Romney.